Waited for two weeks and Monday blues instantly cured at the arrival of lovely parcel. I can’t wait to read through the stories. 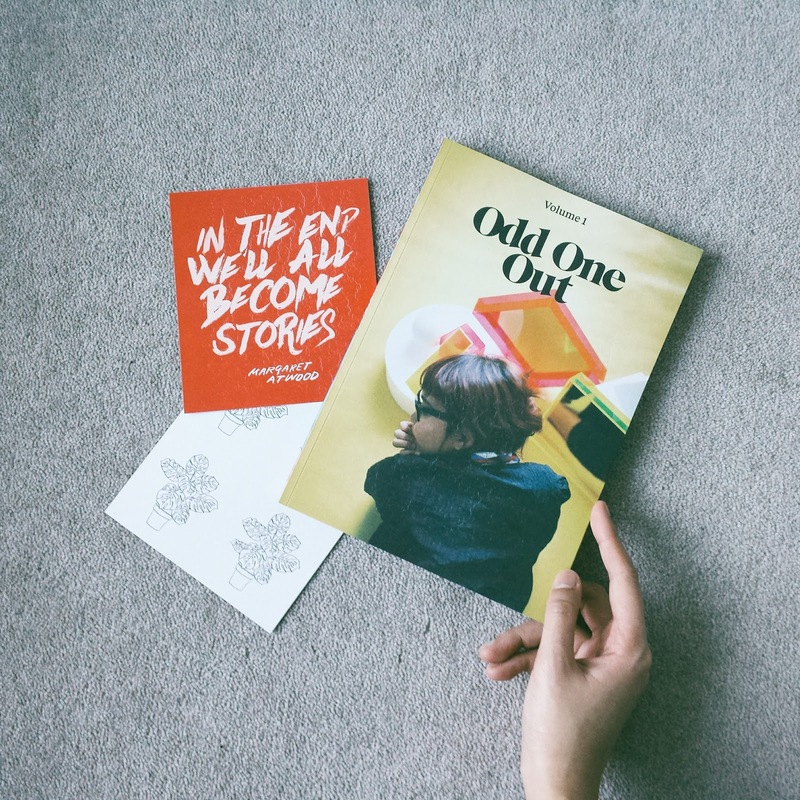 Will update with my personal review on the inaugural issue of Odd One Out Mag. I can’t spell out how much I love this magazine and most glad that editor-in-chief of this magazine went with her “sheer blind optimism” or “the stubbornness to defeat” to send this magazine for print despite a lack of positive response from campaign. But i am going to make an attempt profess my love for Odd One Out (OOO) (and it may sound biased in worst case). Before discovering this magazine, I came to a point of aspiration after been long troubled at questioning my purpose of life. I suppose OOO came at a beautiful timing, which allows me to discover a beautiful gem of printed matters from Malaysia. I couldn’t be more proud of and relieve to know independent magazines are able to found its base when there has been so much debate on dying print. The purpose of this magazine--to share an appreciation to Malaysian culture and local talents who aren’t afraid to be unique and break the mould--resonates so much with me. Rushed with a pungent smell of printed papers upon the first few flip through of pages, it intoxicates me with delicately curated words and grainy raw images that evokes a sense of nostalgia. It is hard to choose one favourite piece, because every pages reveal something more about Malaysian talents and foreign happenings expressed through Malaysian perspectives. From peeking into the minds of solo wanderer to discussion on modernisation, OOO exposes the beautiful minds speaking on matters that are close to our hearts. 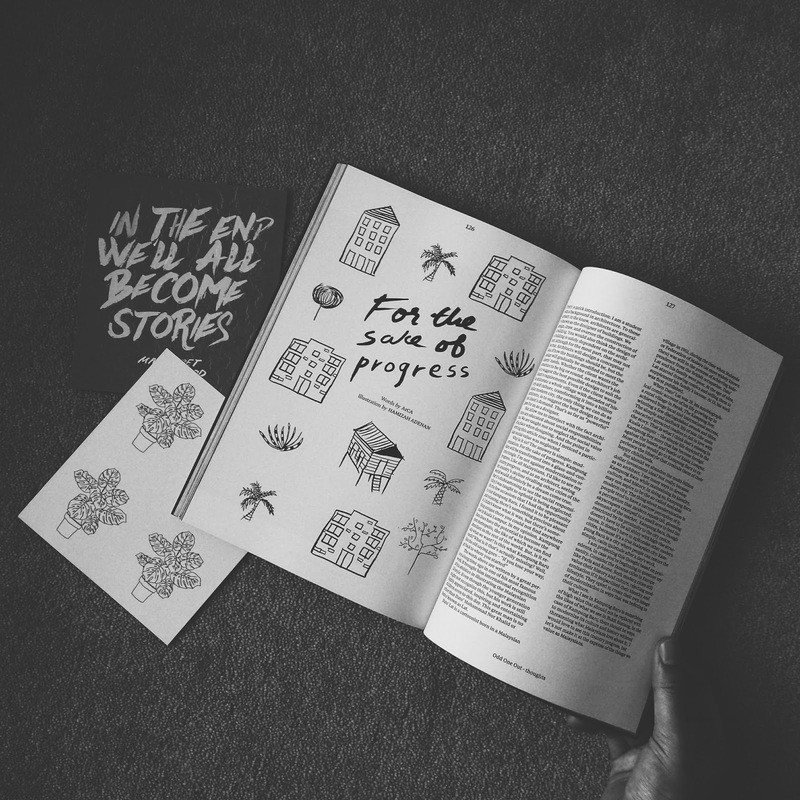 It was definitely hard to pick my favourite piece, but one article that left the deepest impression on me was “For Sake of Progress” by ArCa and Hamizah Adenan--editor-in-chief of OOO. It speaks of the progress of modernisation conflicting with ethics faced by an architect. I am not an architect, but I have experienced the mixed feelings on modernisation as well, and I felt that they have reflected on this topic succinctly without stretching the context too formal for audiences to relate.